Rugged multi-core computing technology is enabling the generation of more detailed and more accurate bathymetric maps at a faster rate. Modern hydrographic technology enables marine researchers to explore and map the oceans' depths in greater detail than ever before. It also has commercial applications, helping oil and gas companies locate undiscovered natural resources and lay pipelines and cables cost-effectively and with minimum disruption to the environment. Moreover, surveillance of continental slopes, rifts and ridges provides vital information for disaster management. All of these sectors require high-availability systems that produce detailed hydrographic information captured in the most cost-effective and efficient way. This is why Atlas Hydrographic, one of the leading suppliers of hydrographic systems, is taking advantage of the latest rugged CompactPCI multi-core technology to produce bathymetric maps with unprecedented levels of detail and accuracy in the shortest time. 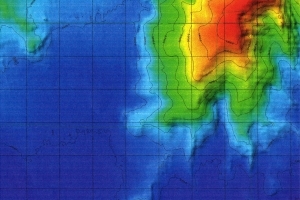 Hydrographic systems use echo sounding to create maps of the seabed. An array of transducers is mounted on the hull of a ship that traverses the area to be surveyed. The different Atlas Hydrosweep multi-beam echosounder systems each have up to 12 x 144 multi-channel transducer modules arranged in a precise geometrical pattern. Each transducer element sends out a sound pulse, or 'ping', creating a sheet of sound that covers a large area to the right and the left of the ship. The returning signals are processed by an onboard computer to produce detailed bathymetric maps. Systems that generate more detailed and more accurate maps have a competitive advantage. The recently upgraded Atlas Hydrosweep DS - one product of the Atlas Hydrosweep product family - now processes up to 1.8 million digital amplitude signals per second instead of the previous 0.9 million samples - an increase of 100 per cent. It also enables survey vessels to cover a wider seabed area in the same period of time (eg, now 5.5. times the water depth coverage compared with the previous 3.5 times water depth coverage - an increase of 60 per cent). At around EUR20,000 for every day a ship spends at sea, the financial savings are considerable. 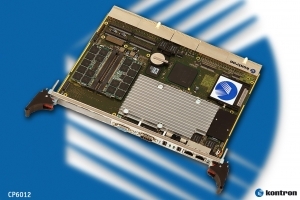 Central to boosting the system's performance are its high-performance 6U CompactPCI CPU boards from Kontron. System designs based on the established PICMG 2.x CompactPCI standard are ideal for the type of rugged conditions found at sea. Their robust connectors, metal guides and metal front plate hold the highly integrated boards firmly in place inside the mounting cabinet. The electronic connectors are also robust, providing a board design that is inherently resistant against the vibrations and shocks that occur on board a survey vessel. And since the chosen CompactPCI boards are designed for use in a wide range of environmental temperatures, they easily cope with the extensive temperature ranges under which survey vessels operate - from arctic to tropical waters. In order to find the right balance between ruggedness, temperature range and performance requirements, Atlas Hydrographic selected two Kontron CP6012 CompactPCI CPU blades equipped with Intel Core Duo 2 x 2.0 GHz processors and 4 GB of dual channel 400 MHz DDR 2 RAM. Especially designed for bandwidth intensive applications, the robust Kontron boards enable the Hydrosweep to reliably operate at a higher ping rate for processing more information in a shorter period of time. 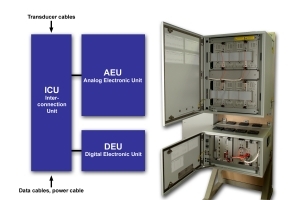 The boards are located at the heart of the system's DEU (digital electronic unit). Before the signals reach the Kontron boards, the returning analog sound pulses are converted into digital samples by the system's AEU (analogue electronic unit). This unit also performs pre-processing operations on the data to reduce it from 10 million to 1.7 million amplitude samples per second. The digital signals are forwarded via Ethernet at a rate of up to 13.6 MB per second (1.7 million signals @64 bits per signal) to the first CP6012 which performs specific DSP (digital signal processing) routines running on the board under embedded Linux. A point-to-point Ethernet connection then transfers the processed data to the second CPU board where the 'higher order beamforming" software applies complicated filter and feature recognition algorithms to the incoming data and provides water depth measurement results at a high resolution and accuracy. Atlas Hydrographic wrote the software that runs on the CP6012 under Windows XP. Once processed, the depth information is transmitted via the board's second GBit Ethernet port to a post processing workstation where the maps can be displayed and edited by an operator. The information is also stored on a 2.5 inch hard drive connected to the CP6012's SATA interface. The same CP6012 board also controls the entire Atlas Hydrosweep system. It receives and executes operator commands from PC terminals connected via Ethernet and automatically controls the Hydrosweep's intelligent subsystems which are also connected via Ethernet as well as via the board's serial ports. For easy servicing and maintenance, engineers are able to access the system directly with keyboard and mouse via the CP6012's USB 2.0 ports. A monitor can be directly connected to the VGA interface. For Atlas, it was important to find a supplier who could deliver processor boards that met all of their demands: "Kontron was one of the first manufacturers to offer a board which fulfilled all of our requirements on performance, temperature range, ruggedness and I/Os," explains Joachim Reuter, Technical Project Manager of Atlas Hydrographic. "The Kontron CPU boards enable our new Hydrosweep to reliably capture and process more information than was previously possible. We can now offer our customers a system that generates more detailed and accurate maps. In shallow water ships are also able to traverse and survey an area at greater speed which results in financial savings for our customers." System users also benefit from the impressive power/watt ratio of the multi-core technology that provides approximately double the performance of a single core processor at similar power consumption and at a TDP of only 31 Watts. As a result, the CP6012 also reduces the burden on system cooling when operating under hot environmental conditions. As well as supplying the CP6012 CPU blades, Kontron also supplied Atlas Hydrographic with a test system for the early stages of the project. "Based on the great cooperation and support we received during this project, we will continue to choose Kontron products for our future projects," concludes Joachim Reuter. Kontron's CP6012 offers a high degree of integration and the latest interface technologies such as PCI Express, up to 4 GB/400 MHz DDR2 SODIMM RAM (6.4 GB/sec throughput) and a fast Serial-ATA hard drive interface or CompactFlash slot on board. Four Gigabit Ethernet interfaces via PCI Express (two to the backplane/two front-side), max. 4xUSB 2.0, 2xCOM, VGA, PS/2, PMC/XMC slot and rear I/O support round off the feature set. Software support is offered for Linux, Windows XP, XP embedded, VxWorks and Windows Server. For applications that need to withstand tougher conditions, the passively cooled Kontron CP6001 featuring up to 4GB of soldered RAM and soldered application flash comes in three rugged levels, R1, R2 and R3.